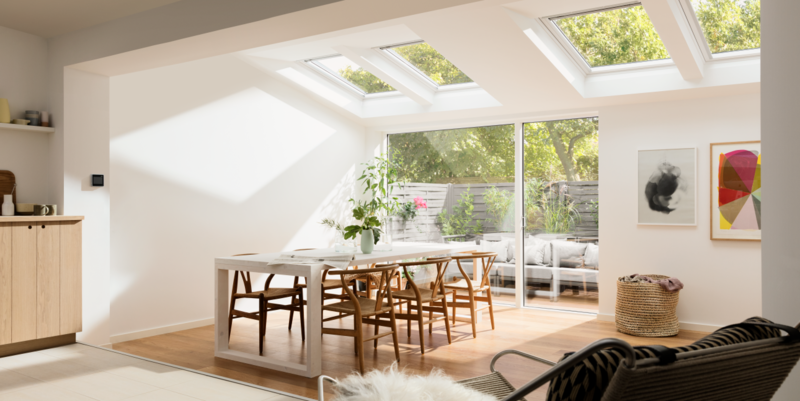 Extensions are a fantastic method for creating extra space in your home and installing VELUX roof windows will bring in more natural daylight to help transform your extension. The illusion of space can be enhanced through natural light and installing a roof window can allow twice as much daylight as same sized vertical windows making your new room’s environment feel even more spacious and comfortable. When building your extension, bi-fold or patio doors and any vertical windows are usually fitted in the furthest point from your original room and often, even on the brightest summer days, daylight struggled to penetrate into the room. While planning it is important to consider this and think about how daylight enters your home from sunrise to sunset as this will dictate where you position and place VELUX roof windows. The more roof windows you install the brighter the space will be but over and above this the positioning affects the stream of light too so as well as considering how and where daylight enters think about the location of them and what areas of the room will reflect the light. Lighter coloured walls will reflect daylight into darker areas of your room. Ventilation is also a key consideration; if it is well designed natural ventilation will replace stuffy, stale air with fresh air. If your new extension is for a kitchen then effective ventilation is even more of a priority. If your project is a flat roof extension a roof window can equally transform this living space and should be an important element of the design. VELUX offer practical solutions for roofs like these, find out about the VELUX INTEGRA® range which allows you to have daylight and fresh air at the touch of a button. The VELUX INTEGRA® range offers both solar and electric roof windows, the solution for out of reach areas in your extension. Another consideration is the finish of a roof window. VELUX white-painted roof windows reflect even more daylight into your room and will also complement other white windows within the property. VELUX offer two options: White Painted and White Polyurethane. White Polyurethane roof windows are built with a wooden core encased in a polyurethane coating for a more durable and moisture resistant finish, ideal for humid rooms like kitchens. A final option when planning is to choose the right glazing option, depending on the functionality of the room there are several options you can choose between for example: VELUX enhanced noise reduction glazing or VELUX energy efficiency glazing. VELUX commitment to you doesn’t end upon installation, all VELUX Roof Windows are backed by a 10 year manufacturer's guarantee. To find out more about the VELUX range, call into your local Magnet Trade store or enquire now. Find the size for you here.